OmniGraffle Pro occupies a unique space in the software world. Part drawing program and part charting tool, with a bit of presentation software thrown in there for good measure, nothing is quite like it. Fundamentally, OmniGraffle is a vector drawing tool that draws objects and lines to connect them. Organization charts, flow charts, network diagrams, and mind maps are among the most obvious tasks OmniGraffle is designed for. But however simple it may seem at first, OmniGraffle is remarkably powerful and flexible, and version 5.0.2 is a worthy refinement to an already mature product. Standard OmniGraffle is aimed at users who don’t necessarily make a living with diagrams but require the kind of precision that a simple drawing application can’t deliver. The Pro version picks up some high-end capabilities, such as greater support for Microsoft Visio files, custom data tables for each object, sub-graphs for taming very large documents, automatic document scaling, ColorSync support, and a simple presentation mode. Upon launching OmniGraffle Pro, you’re presented with the option of creating a new document from a range of templates. The generally simple and utilitarian templates are grouped by type: Drawing, Brainstorming, Organizational Chart, Space Planning, and Miscellaneous. The drawing group includes a blank template for those who wish to start from scratch. Space planning templates are blank, but have scaling set up in advance. For example, you can choose the “1 inch = 1 foot” template and lay out a room without having to perform scale conversions for each object in the diagram. The simplest way to add objects to a new document is with OmniGraffle’s stencils. Stencils are groups of objects, like lines, shapes, and symbols, that you drag from the stencil palette onto your document. The product ships with stencil collections for creating documents such as circuit diagrams, flowcharts, entity relationship diagrams, maps, and organization charts. User-contributed stencils posted at Graffletopia can now be downloaded and installed directly from the stencil window. Once a few objects are in the document, they can be linked together by drawing lines between them. Lines can be straight, curved, or orthogonal (think organization chart lines). As you drag an object around the canvas, connected lines come along. While the initial result of a move isn’t always beautiful, rearranging a line’s connection points is a simple matter. OmniGraffle is rich with thoughtful flourishes, like guides that automatically pop up to help you place an object in just the right position. OmniGraffle’s star really starts shining when it’s time to fine-tune your document. You can choose a color with the standard Mac color picker, but OmniGraffle also offers four types of gradient fill, with customizable colors, transparency, direction, and intensity. The 25 line varieties can be customized with miter or bevel joints, and you can specify corner rounding to the pixel. Lines and shapes can be sculpted with bézier curves. This degree of control extends across OmniGraffle’s capabilities. While you can get overwhelmed with the possibilities, OmniGraffle’s interface is remarkably accessible. Though I have no experience in graphic design, I was able to find my way around the tools and create clean, well laid out diagrams. No one’s going to think I’m a design pro, sure, but they will stop cringing. OmniGraffle Pro opens and converts a variety of other file types. My informal testing found conversions to work as advertised for Microsoft Visio and OmniOutliner ( ) files. Drop a folder from the Finder onto OmniGraffle and it will diagram the folder’s contents. While this worked fine for simple structures, large numbers of files and folders resulted in unwieldy diagrams with overlapping file names. The remaining file types OmniGraffle can convert tend to be very specialized. Programmers may find it handy to visualize the relationships in Xcode projects or nib files, but the lack of more broadly used formats like OPML, HTML tables and lists, or even plain text outlines is puzzling. Exporting is much more satisfying. Standard graphic formats such as GIF, JPEG, PNG, and TIFF are present, alongside vector formats like EPS and PDF. OmniGraffle Pro also writes to Visio XML, making it capable of round-trip sharing with users of Visio—a Windows-only product. All the formats I tested turned out sharp, accurate versions of the original. Version 5 of OmniGraffle adds a moderate array of new features, primarily targeted at enhancing productivity. New mini-inspectors are context-sensitive controls that populate the space just below the standard OS X toolbar. Tools that are applicable to the selected object appear. Along the bottom of the window resides the new style tray, which contains up to eight icons representing the fill, stroke, image, shadow, shape, font, and text position attributes of the currently selected object. The eighth icon represents all style attributes applied to the selected object. When a style tray icon is dropped onto a layout object, the object picks up the style attributes of the icon—a handy way to reformat several objects in rapid succession. OmniGraffle Pro 5 sports a new layout engine based on the open source Graphviz software. 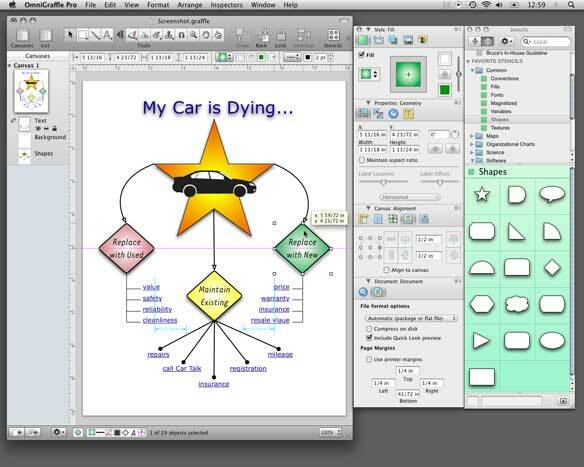 Graphviz powers OmniGraffle’s automatic layout feature, which permits users to click among several basic layout types. While transitions among layout types are smooth and fast, in almost all cases you’ll still need to manually revise the layout to get it looking just right. OmniGraffle’s overall performance on my MacBook Pro was excellent. Importing and exporting large documents were the only operations that required a wait, but even those were well within reason. OmniGraffle Pro 5.0.2 is an excellent product. The comfortable user interface belies the depth of its capabilities—a model for complex software. A preponderance of arcane import formats is the only significant blemish. Creative pros will probably require greater artistic control in their vector drawing tools, but everybody else ought to give OmniGraffle Pro a look.